I've never been on a plane before in my life. I am a little bit nervous, but mostly excited. I watched a safety video by some of my favourite sports team, the All Blacks, to learn a few things about flying safety. 1. 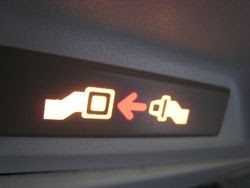 When you see the seatbelt sign, make it click. 2. Turn all gadgets to flight mode. 3. Listen to the flight crew. Bonus thing I learnt, Israel Dagg is a pretty good rapper. He is a pretty good rapper isn't he. What is a rule, or maybe a feature for the plane you would make for an airline? I know you haven't been on a plane, but you might come up with something interesting. I didn't go on a plane until I was 11 and that was only a really short little flight. I still sometimes get nervous on flights - just last night I was on a flight that bumped and crashed it's way across the Pacific Ocean and there were moments I felt like the wings must fall off - but luckily we landed safely in Auckland. Flying is really an amazing engineering achievement and I hope you get to experience it one day in the very near future - just ask mum nicely! When I was in year 6, the Ambassadors flew to Wellington, and upon landing, the winds really picked up, and we all thought that we would crash! On a different note, if you could create your own airplane, what would it look like?